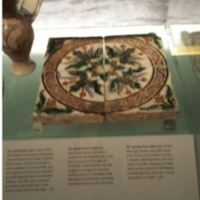 The set of cuenca seca floor tiles recovered from All Hallows Church, Lombard Street are displayed in the Medieval Gallery of the Museum of London. They are situated in a display highlighting the aretfacts of London's fine material culture in the Late Medieval/Early Modern period. Joe O'Brien, “Cuenca Seca Floor Tile on Display at the Museum of London,” Medieval London, accessed April 22, 2019, http://medievallondon.ace.fordham.edu/items/show/115.